One of the first games I ever played was a text adventure called Colossal Cave Adventure. You can play the game on-line here to get an idea what text adventure games are like. Arguably the most famous of this genre of game is the Zork series. You are in a dusty castle room. Passages lead to the north and south. You are in the armory. There is a room off to the south. You are in a torch-lit hallway. 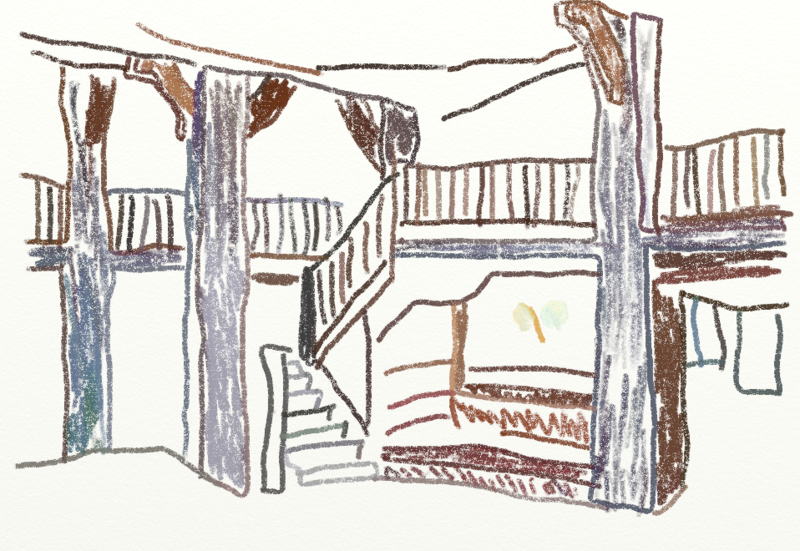 There are rooms to the east and west. You are in a bedroom. A window overlooks the castle courtyard. A hallway is to the west. You are in the kitchen. It looks like a roast is being made for supper. A hallway is to the east. Next, number all of the rooms starting at zero. 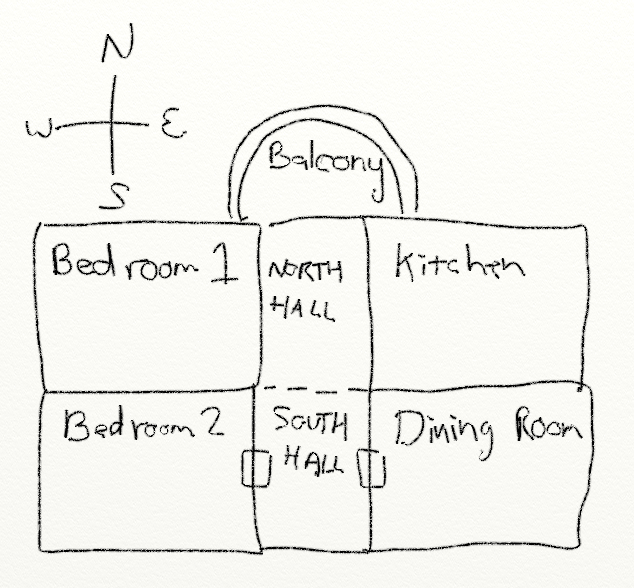 Use this sketch to figure out how all the rooms connect. For example, room 0 connects to room 3 to the north, room 1 to the east, and no room to the south and west. Create an empty array called room_list. Append this room to the room list. Repeat the prior two steps for each room you want to create. Just re-use the room variable. Create a variable called current_room. Set it to zero. Using current_room and room_list, print the current room the user is in. Since your first room is zero, the output should be the same as before. You are in a room. There is a passage to the north. Create a variable called done and set it to False. Then put the printing of the room description in a while loop that repeats until done is set to True. Before printing the description, add a code to print a blank line. This will make it visually separate each turn when playing the game. After printing the room description, add a line of code that asks the user what they want to do. Add an if statement to see if the user wants to go north. If the user wants to go north, create a variable called next_room and get it equal to room_list[current_room], which should be the number for what room is to the north. Add another if statement to see if the next room is equal to None. If it is, print “You can't go that way.” Otherwise set current_room equal to next_room. Test your program. Can you go north to a new room? Add elif statements to handle east, south, and west. Add an else statement to let the user know the program doesn't understand what she typed. It is a great idea to put blank lines between the code that handles each direction. I don't mean to print a blank line, but actually have blank lines in the code. That way you visually group the code into sections. It is a great idea to add comments too, to each section. Test your program. Make sure you have enough of a description that someone running the program will no what direction to go. Don't say "You are in the kitchen." Instead say "You are in the kitchen. There is a door to the north." Optional: Add a quit command. Make sure that the program works for upper and lower case directions. Have the program work if the user types in “north” or “n”. Spend a little time to make this game interesting. Don't simply create an “East room” and a “West room.” That's boring. Also spend a little time to double check spelling and grammar. Without a word processor checking your writing, it is important to be careful. Use \n to add carriage returns in your descriptions so they don't print all on one line. Don't put spaces around the \n, or the spaces will print. What I like about this program is how easy it is to expand into a full game. Using all eight cardinal directions (including “NorthWest”), along with “up” and “down” is rather easy. Managing an inventory of objects that can exist in rooms, be picked up, and dropped is also a matter of keeping lists. Expanding this program into a full game is one of the two options for the final lab in this course.